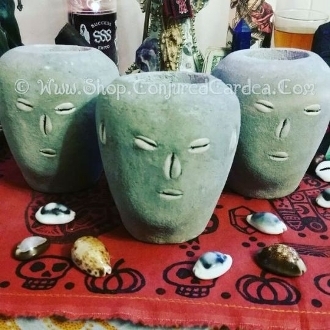 These are 4.25 inch Eleggua heads created from cement with the traditional cowrie eyes, nose and mouth. Each head has a space in the top which can be filled with curios, herbs or any offering. Each head comes with a skelton key and 3 cowrie shells. Place your Eleggua behind your front door to bring luck and open roads to your household! Give him offerings of blakc coffee, coffee beans, candy and small toys.